The inaugural SFS Global Youth Media Conference is a student-centered journalism and storytelling conference hosted by SFS Voice Lab, Inspire Citizens’ Global Youth Media, and the award-winning Out of the Blocks podcast from Baltimore, Maryland. The mission of the conference centers on the power of media to spark empathy, build community, and create positive change in our challenging world, while also linking to the SFS and Inspire Citizens global partnership for implementation of the Sustainable Development Goals. 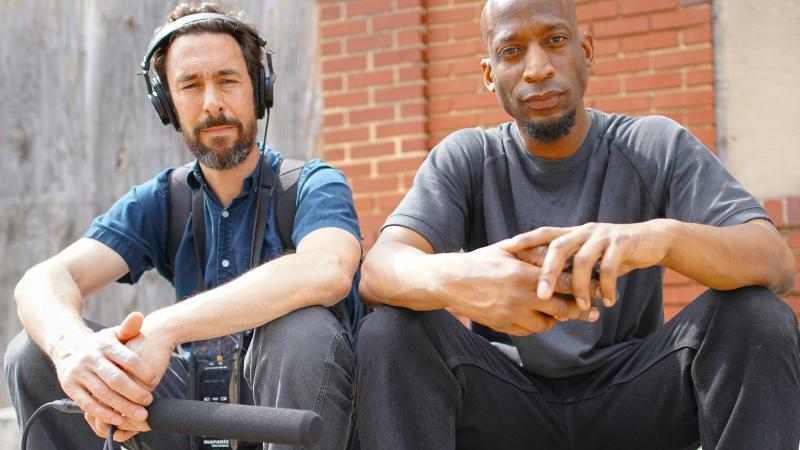 Aaron Henkin & Wendel Patrick: Out of the Blocks is an award-winning, immersive listening experience built from a mosaic of voices and soundscapes on the streets of Baltimore. A custom-tailored score embroiders this tapestry of stories hidden in plain sight. This program is supported in part by the Maryland State Arts Council (msac.org). 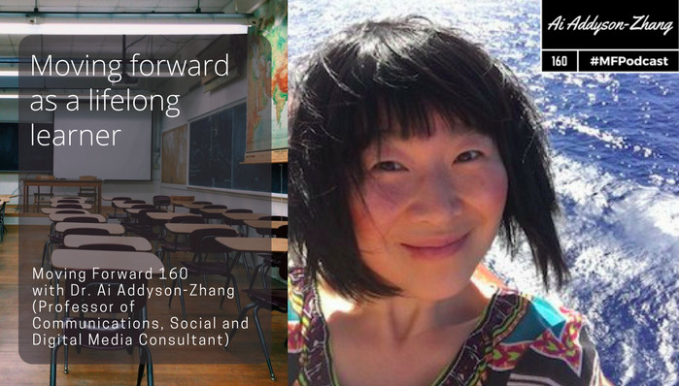 Ai Addyson-Zhang, Ph.D., is a community building expert who consults on digital learning and storytelling. She trains academic and industry leaders to leverage digital storytelling to humanize their brands and create impactful community engagement. Anthony Kuhn is the National Public Radio correspondent in Seoul, South Korea. He was previously NPR's correspondent in Beijing, China. He has been called "NPR's voice in China" by the Harvard Gazette and is a world renowned journalist for his dedication, integrity, and extensive work in Asia. Aaron Moniz and Steve Sostak are the co-directors of Inspire Citizens and Global Youth Media focusing on the power of student agency and voice in positive and honest reporting and storytelling. Christina Lin has been a lead reporter and co-director of the first Global Youth Media station in Beijing, China called Futures Public Radio. She now works as an Inspire Citizens student intern and supports member stations in establishing student agency in journalism technology, programs, and platforms. Jason Moran of Moran Creative is a post-production guru from Los Angeles, California who specializes in sound and video editing and mixing. 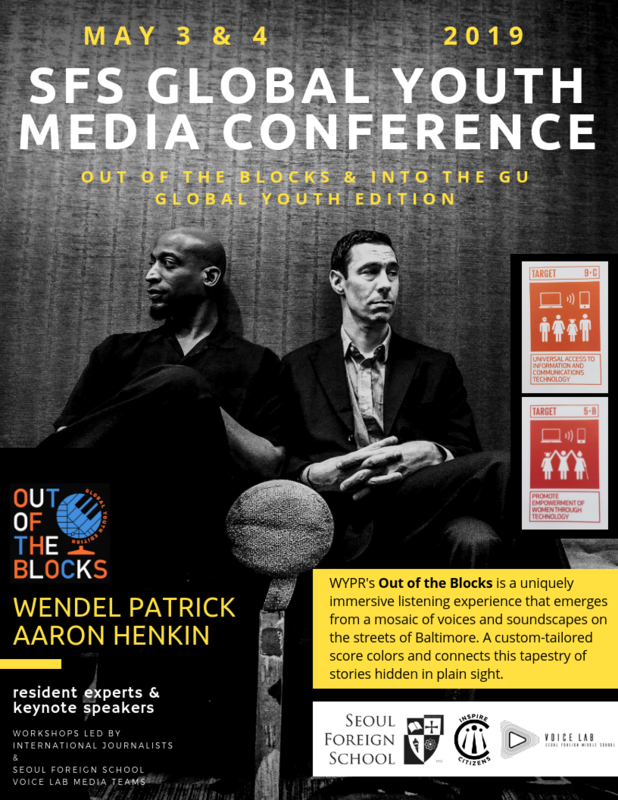 Seoul Foreign School is pleased to announce, in cooperation with Out of the Blocks and Inspire Citizens, the inaugural SFS Global Youth Media Conference on May 3 and 4, 2019. This conference, for students Grades 7-10, is perfect for a team of students and teachers who are interested in journalism, story telling, sound and video recording, movie making, editing, and more. Check out the complete 2-day schedule HERE or in the images above. Last year SFS took a team of 7th graders and teachers to a similar conference in Beijing and with the skills and knowledge they brought back, things quickly took off at our school. This led to authentic learning with the "Into the Gu" project, the Middle School Voice Lab Club/MYP Design Project (voicelab.seoulforeign.org), and middle school students working directly with our marketing team. Even if you only bring a team of four students and a teacher, it will be worth it for your school and students as they will have access to working not only with Voice Lab student leaders, but award winning global journalists and storytellers. All participants are expected to bring their own smartphone and computer. For hotel information near Seoul Foreign School, see below or please click HERE. We are looking forward to an awesome conference! Please feel free to pass this on to anyone who may be interested. ** To reserve a room, please email reservationgrandseoul@hilton.com. Indicate the type of room, # of guests, and dates of stay. Please state that you are using the “SFS rate” to ensure the discounted rates above. * Transportation to SFS is provided for those attending the conference. ** To reserve a room, please email roy.kim@hanwha.com. Indicate the type of room, # of guests, and dates of stay. Please state that you are using the “SFS rate” to ensure the discounted rates above. * Transportation to SFS NOT provided. Must take public transportation or taxi to SFS. Both are easy to find. ** To reserve a room, go to https://www.lottehotel.com/hongdae-l7/en. Book your rooms and enter this Promotion Code: COFSF1. The above rates should be applied to your reservation. Contact matthew.johnson@seoulforeign.org for any questions or further information. See you in Seoul for this incredible event celebrating student voice & community impact.